Just ME: Beary Merry Noel. I've been neglecting the blog a little, with the busy-ness of the season (read: figuring out what to do with the elf every morning!) If you'd like to see what our elf has been up to, you can follow his adventures on instagram! 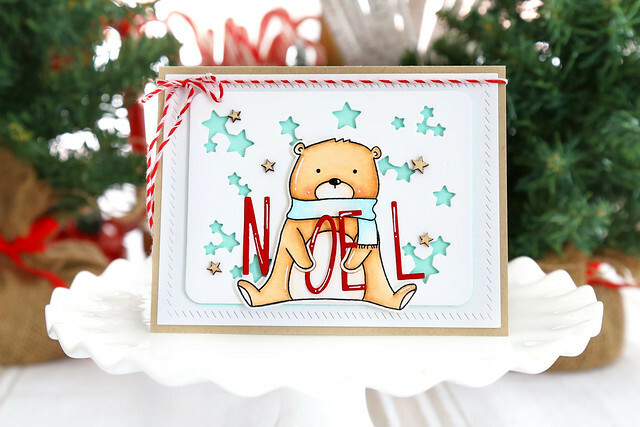 For now I have a Christmas card to show off, featuring the sweet bear from Beary Merry. Then, I used the Journaling Alphas to cut out the letters to spell NOEL. I live in Montreal and we are very bilingual. I need cards for those french-speaking teachers and neighbors! I love how the die set for Beary Merry allowed me to tuck the middle letters into his arms. It's just so cute! Next, I used the large rounded rectangle from the Succulent Journaling Card die set and cut 2 layers: one out of white cardstock and another out of a pale aqua. I used the Lucky Stars dies to cut stars out of the white layer, so that the aqua would show through. I used some wooden stars and a kraft card base to reinforce the soft brown of the bear. 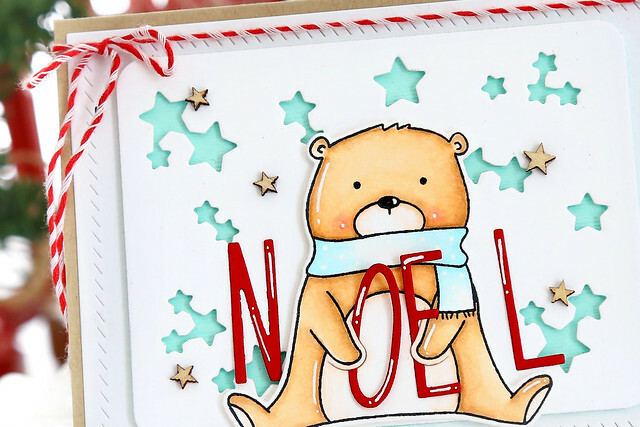 A white gel pen was used to add finishing touches to the letters and the bear. A cute card! I like the colors. Beautiful!